The average North American consumes more than four hundred Africans. Wow. A friend sent that sentence to me, and I was afraid for those unfortunate Africans who get consumed. Unfortunately, astoundingly stupid sentences like this amphiboly get printed, posted, and advertised all too often. An amphiboly is a fallacy worded strangely so that the meaning of the sentence could get misconstrued. Here is another amphiboly: “Iraqi head searches for arms.” Note to self: Proofread carefully, and perhaps show what you have written to someone else who might catch your stupid mistakes. Here’s another: A farmer’s market near my house posted a sign that said “Now Hiring Ripe and Tasty Tomatoes.” I’m not sure what to think about that one. A couple of pet peeves make their way to the top of my grammar and proofreading list. First is the misuse of the words “who” and “whom.” A book I just finished reading tried to sound very proper, I am sure, by saying “Whom is the one you suspect?” Now unless “Whom” in this case is the name of a character in the novel, the author (and her editor) is guilty of butchering grammar. “Who” is a subjective pronoun, just like “it,” “we,” “he,” “she,” and “they.” When the pronoun becomes the subject of the clause, “who” is properly used. “Who is the one you suspect?” becomes the clear winner here, because in this case “Who” is the pronoun. I must tell you about another great pet peeve of mine: “I feel.” Too many times each day I hear a politician, a speaker, an entertainer say “I feel it is important to…” This, to me, is a sign of the degradation of our intellect. Really what you’re saying is “I think” or “I believe.” Why can’t you just say that? Possibly because the assertion of your beliefs can be offensive to another person, so you disguise what you believe by saying it is what you feel? That’s pretty wimpy. It may not surprise you to know that my students are not allowed to tell me what they feel, unless they are describing the state of their health or emotions. If they want to assert a point in my class, they must accompany that point with the correct words: “I believe,” “I think.” Don’t tell me it’s what you feel. “I feel it is important to assert your beliefs clearly and unambiguously.” Gag. In my previous blog, I mentioned a few grammar slips that make me twitch. (I tell my students that this is all about me anyway, so do NOT make me twitch.) I thought I would give you a few more on my top Pet Peeve list of grammar and usage errors. The word “although” is often used interchangeably with “however.” However, it should not be mistaken for replacing the “however” I just used at the beginning of this sentence. The word “although” has a couple of uses and one specific way it should NOT get used. Correct: “I agree with your point, although I can see the other side to the argument.” Use it like however here. It does not need to be surrounded with commas; just the one comma in front, because it is a conjunction. Correct: “Although you and I never agree, I still love you.” Here the conjunction needs a comma after the phrase in which it is used, because you are connecting a dependent and independent clause. So while “however” can be used to replace “although,” the word “although” cannot be used completely interchangeably with “however. “Build off of.” Twitching begins here. I do not build an argument OFF of something else; I build an argument ON something else. I’m not sure how this became misused, but I see it more often lately. Think of this as a building problem. I cannot build a bridge off of a foundation; I must build it on a foundation so that it is firmly rooted to the spot. As school begins for most students over the next few weeks, I am reminding myself of those common errors many students make on their homework. So here are a few, not in any particular order. They all make me twitch madly. Lead/led. Did you know that “led” is the past tense of the verb “lead”? Neither do many of your fellow students. Some of them might include the following phrase in their homework: “He felt lead to talk to the judge.” Well, I get stumped. He felt lead? Does it mean he felt like lead, thus making it hard to walk? Or perhaps he reached out and rubbed some lead, which then inspired him to go talk to a judge (who probably should have tossed him out of court for going around feeling lead). Him/her, he/she. I know many college professors will contradict what I say here. When referring to a generic person in their writing, students may feel led (!) to say “him/her” instead of just “him.” This caves in to that politically correct rubbish that wants to give equal treatment to men and women in all forms of communication. First, please remember that as a woman, NOT politically correct, I will never take offense at someone who uses “he” instead of “he/she.” Second, remember that the generic person about whom we write is a human, part of the human race, and “he” used in place of “he/she” suffices to cover all of humanity. So does “she,” if you must. I do, however, warn my students that when they get to university, they will have to follow the directions of their (usually politically correct) professors. But when writing for me, use one pronoun: either he or she, but not both. Very, really. Boring, unspecific writing can cause even the most dedicated reader’s mind to wander. Don’t just tell me that the man was very mad or really mad. Tell me HOW mad; tell me how that looked or sounded. In very cold weather, tell me how cold. What does that feel like, look like? If you really, really want to communicate degree of pain or cold or desire, then leave off the very and the really and use more descriptive words. Really. Be-verbs–also known as the joy-killer. Once told that they cannot use more than one be-verb per paragraph, they begin longing for it, begging for it, using it more often, losing major points for it. Be-verbs (am, is, was, were, are, be, been, sometimes being) are more passive than others. Can you figure out a way to say it without using those be-verbs? “He was running for President” could change to simply “He ran for President.” Easy! I had a student once who had the formula figured out. He would replace every be-verb with maintain, exist as, subsist as, and a few others. Trouble was, those verbs then became his crutch, and he overused them. The poor guy was banned from using those replacement verbs for the duration of the school year, on top of only one be-verb per paragraph. He thought he might die, but he graduated and even went on to do well in college. He became an engineer, figuring out formulas for doing things easily and well. And people can understand his writing, too. After I pick on a few common grammar errors, I thought I would share a couple of funny links I have come across. That reminds me: the other day I heard someone say “acrosst,” and my brain nearly exploded. I hope my face did not betray my treacherous feelings. One such mistake is the mixing up of the words then and than. Oh, they sound so similar, yet they have such different applications! The word “than” is used for comparative purposes. “I have fewer grammatical errors than he does.” “Then” is an adverb, an adjective, or a noun, depending on its use. It gets mistakenly misused in place of that comparative “than.” Often “then” is part of a sequence (“after this, then that”) and can be misused at that time. Just remember “than” is comparative. One more beef: The word until, which often gets shortened. The word to which it gets shortened is ’til. You know, when some letters get removed and replaced by an apostrophe? In this case, those letters are “un.” Many writers will replace it with till, a word with a completely different meaning. One of my critics likes to argue usage to defend misusage. This person will probably say this mistaken use of ’til has been so often used, that it has become acceptable. Indeed, I have a book on my bedside table by CS Lewis, Till We Have Faces, which might prove this critic correct. It still makes me cringe, Lewis or not. I would argue that several wrongs do not make a right in this case. Till is a totally different word! Now for some very funny grammar mistakes, and the fun we can have with them. This comic shows how someone can have a physical reaction to bad grammar. I often feel like this. And here is a test I would like the internet to administer before allowing people to use it. Keep those grammar peeves coming! I could of used more this week then the week before… (twitch). Some grammar errors make me cringe in a big way, like when I am in line at a store and hear someone say “I didn’t like them shoes.” I get furious at the teacher who let that one slide in her class, way back in third grade. But then again, maybe the teacher herself said it. That makes me think of the impact of a teacher. Back in the 1930s, when families were leaving the hills of Arkansas and other states in droves, heading west to greener lands, my dad was a boy. Fresh from Arkansas with his parents and loads of siblings, he was a fourth-grade back-woods farmer boy in New Mexico. His teacher didn’t sound like his family at home, nor did she sound like the drawling New Mexico kids from all sorts of backgrounds. “You talk different,” he drawled. She agreed. They struck up a friendship when he asked her to teach him how to speak better. She worked with him as much as she could, this boy who needed to be back on the farm pretty quickly. And my dad became the first boy in his family to graduate from college–he even earned his Masters–and he never spoke like his Arkansas family again (not that he was ashamed; he just consciously spoke differently from then on). He left the farm, moved to Colorado, and eventually became a school administrator. That teacher had a lasting impact. I am certain teachers are out there battling the poor grammar of their students, but I sure do get discouraged when I see signs with poor grammar or hear conversations in public with language not fit for public consumption. Where are the other grammar nazis out there? Am I alone in my obsession? Is the fight for good grammar over? Anyway, this gets me to my next peeve: the word “anyways.” I hear it all the time in conversation, and I work hard to keep my right eyebrow from twitching. This week I found it in a nonfiction book, in an author’s narration. Really? It passed the editor and proofer! Let’s get it straight: “Anyways” is not a word. Never. Have you encountered a teacher who has slammed you for your poor grammar, who has taught you the correct way to say something? Thank her! Chime in here: tell me what she taught you. Butchering grammar 5: Do you trust bad grammar or spelling? That fake FaceBook post that caught so much attention recently only captured me for a second. Remember? It was the one telling us that the date for Marty McFly to zoom into the future in Back to the Future 2 had arrived. Turns out the date was wrong; that won’t happen for another three years in 2015. What caught my attention wasn’t the bad date but the bad spelling. The word “arrives” was spelled wrong; it had only one “r.” Note to self: if I am going to try to pull off a hoax or spread an internet rumor, I should check my spelling and grammar first so I look more legitimate. Then again, if you are “brilliant” enough to want to waste your time on such a stunt, good spelling and grammar will not occur to you. Did you know that gra mmar saves lives? This gem circulated FaceBook recently, and it makes me laugh every time I look at it. What a difference a comma makes! If you want more of that, take a look at the book Eats, Shoots and Leaves. (Did you notice that I didn’t put a comma before the book title? More on that later.) The author tackles ridiculous grammar with humor. The title is even part of a bad grammar story. This reminds me of a couple more comma errors made all too often. I see these in my students at times, but I also see them in blogs and news articles. When you use a conjunction (and, but, or, so, etc. ), you don’t always need to use a comma. Only use a comma when what follows the conjunction is an independent clause. In other words, what follows the conjunction could stand alone as its own sentence. 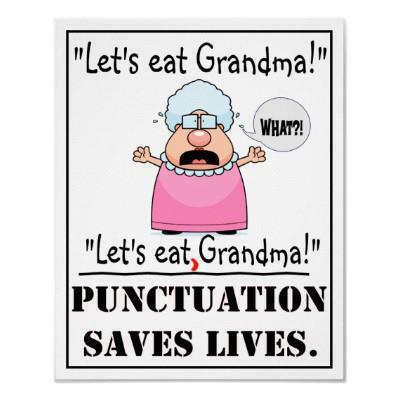 For example, “I had the pork chops, but she enjoyed the spaghetti.” The comma goes BEFORE the conjunction, not after. What followed the conjunction was a complete sentence (or independent clause). Try this one: “I loved the pork chops but hated the green beans.” What follows the conjunction (“hated the green beans”) is not an independent clause; it could not stand by itself as a sentence. There is no comma after the conjunction. A few paragraphs above here I did not put a comma before the book title. That’s because the comma does not introduce the book title. There is no reason for it. Almost all of my examples involve food today. Sorry about that. Happy writing; happy eating! You know what else bugs me? Improper use of the singular/plural agreement, and repetitively redundant repetitions. Digression (are you surprised that I digress? It’s my middle name): A Mercedes car commercial says “Less doors.” Fingernails on a chalkboard to me. Really? Your doors are smaller? Lesser? That should have said “Fewer doors.” Some guy got paid a few million dollars for that genius statement. Now for the third error: unnecessarily repetitive. “There are fewer pesticides in there” may be grammatically correct, but it is too repetitive. Find another way to say “in there,” or just get rid of it altogether. You do not need two “there” in one sentence. Here’s another example of redundant repetitiveness, unnecessarily duplicating thought over and over. “The reason why is because…” Don’t tell me why three times! My students use this one a lot when defending their ideas in class. Each term, “reason, why, because,” tells me why. Choose one of those words and restructure your reasoning. Say “The reason is…” or “I’ll tell you why” or “That is because…” Vary your wording to make it more readable, more enjoyable for your reader. And often your reader is judging you. Especially if your reader is me.